Microsoft released a Surface tablet PC, so now there are two in the Surface family. Which one could be right for you? Let's take a look. Both tablets run Windows 8.1, unlike the previous Surface RT model which came with a dumbed down version of Windows. Both tablets can be used with a keyboard cover (with backlit keys! ), a stylus, and other accessories such as a docking station and wireless display adapter. Besides the different sizes, they both look about the same from the outside, but this is where the similarities stop. The Surface 3 is the more affordable tablet of the two with 2 GB of memory and 64 GB of storage. You can also get double the memory and storage. It has a 10.8-inch display with a 1920x1280 resolution and runs on a Quad-core Intel Atom x7 processor that isn't as powerful as the Surface Pro 3's Intel Core processor, but better for longer battery life (up to 10 hours). While the Surface 3 comes with one year of Office 365 Personal and 1 TB of storage on OneDrive, the Surface Pen is an additional cost with the Surface 3. Finally, this tablet's kickstand only has three positions, unlike the multiple positions of the Surface Pro 3. In general, this is more of a tablet that competes against Apple's iPad than a laptop competitor. The full-size USB 3.0 port, microSD card reader, and Mini DisplayPort (adapters are available for other monitor connections) give it an advantage over the iPad, plus it runs full Windows just like a regular laptop. As you can see, these are more laptop prices than tablet ones, and the Surface Pro 3 goes up against the MacBook Air and the new MacBook Pro than it does the iPad, although it functions like a tablet too. The kickstand is multi-positionable and the Surface Pen is included, but Microsoft Office is sold separately. Battery life on the Pro is also only up to 9 hours of web browsing. On the downside, the Surface Pro 3 has the same ports as the Surface 3 — not enough USB ports in my opinion. It's also a little heavier than the Surface 3, at 1.76 pounds versus 1.5 pounds. The big question, as with choosing any laptop or tablet, is what do you need it for? 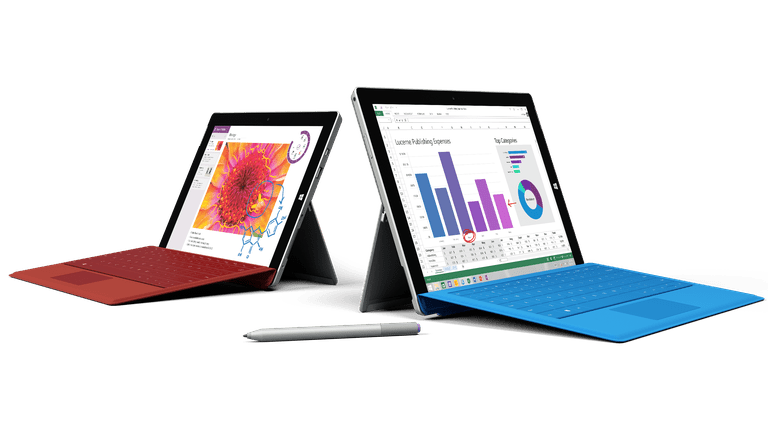 Although the Surface 3 has the same Windows 8.1 experience as the Surface Pro, its smaller size and less powerful specs might make it better for tablet use or as your travel laptop. The Surface Pro 3 makes a better laptop replacement, or when docked, a desktop PC replacement. The Surface Pro 3 is enjoyable particularly because of the multi-position kickstand since many laptops can't be positioned so finely.